Or get up to 25% MSRP cash credit on select models. 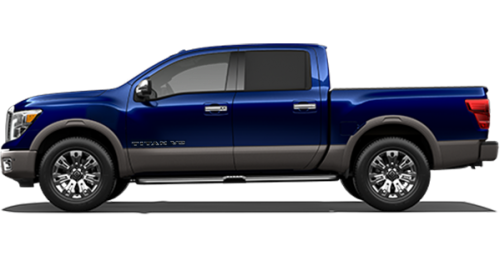 *Representative monthly lease offer based on a new 2018 Titan king Cab SV Premium at 4.9% lease APR for 24 months equals monthly payments of $408 with $3,795 down payment, and $0 security deposit. Lease based on a maximum of 20,000 km/year with excess charged at $0.10/km. Total lease obligation is $13.583. Lease Cash of $14,130 is included in the advertised offer. 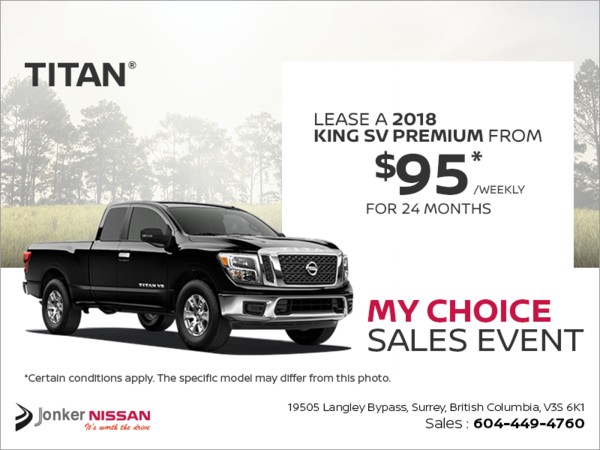 **Up to 25% MSRP Cash Credit is applicable only to new and previously unregistered 2018 Titan models that are cash purchased or financed/leased through Nissan Canada Financial Services Inc. at a standard rate of interest from an authorized Nissan dealer in Canada between April 2nd, 2019 and April 30th, 2019. MSRP Cash Credit: i) cannot be combined with subvented lease/finance rates or other offers; and ii) will be deducted from the negotiated selling price before taxes. Value of MSRP Cash Credit is calculated based on vehicle MSRP, plus freight, A/C and tire charge. $17,700 (25% MSRP Cash Credit) amount referenced is applicable only on the 2018 TITAN Crew Cab Platinum Two-tone with an MSRP of $68,798 plus $1,795 freight & PDE, $0 A/C and $25 tire charge. Amount of MSRP Cash Credit varies per trim and ranges from $5,500 (12% MSRP Cash Credit) to $17,700 (25% MSRP Cash Credit). Dealer may sell for less. See your participating Nissan dealer for complete details.